There is perhaps no other footwear as beautiful or elegant as a pair of leather boots. For some men, walking in a pair of boots is a discomfort, whereas for others, leather boots are thing to show off to the world. Boots are for both men and women, but men do have a lot more variety. There are a huge number of men’s boots to choose from, varying in color, design, and occasion. But most boots that are available today in stores are machine made. These boots are mass-produced, with little thought going into design or details. Although they come pretty cheap and serve the purpose of a boot, they are no match for a handmade pair of pure leather boots. Handmade boots are not hard to obtain, they are just a little more expensive and not readily available in stores because they are mostly made to order. There are specialized stores for handmade boots, where you can get a pair of leather boots customized exactly according to your preferences. Sure, they will be a little more expensive than boots that you can readily pick up from a shelf, but a pair of handmade boots is an investment that you won’t regret. Plus, they are a thing of beauty. Before we begin, do note that there are twelve or more different types of men’s boots, and all of them have machine-made and handmade versions. The latter is what we’ll talk about in this post. But first, let’s take a look at the different types of men’s boots. Winter is the time for all your other footwear to rest and for your boots to do all the work. Along with a smart suit and a classic timepiece, a pair of boots is something every man should have in his wardrobe. Don’t know where to begin? Here are the most popular kinds of men’s boots to consider for different occasions. Chelsea boot: This is a semi formal boot that can be worn to work, to a party, or to any special occasion. It usually comes in a slip-on style, and can be paired with anything from jeans to dress pants. The defining characteristics of a Chelsea boot are a slim leather sole and sharp toe box. Wingtip brogues: If you are unsure about what dress boots you should be getting, the wingtip brogues are a good place to start. They are versatile, can be paired with both formal and casual wear, and last for years if cared for. Desert boot: This is a type of boot that was designed for the military to be worn in dry and dusty conditions. They usually have flexible gum soles, providing comfort and longevity. The most popular version of the desert boot is by Clarks, and it’s also the most affordable. Cowboy boots: This is a western boot style and one of the most popular around the world. 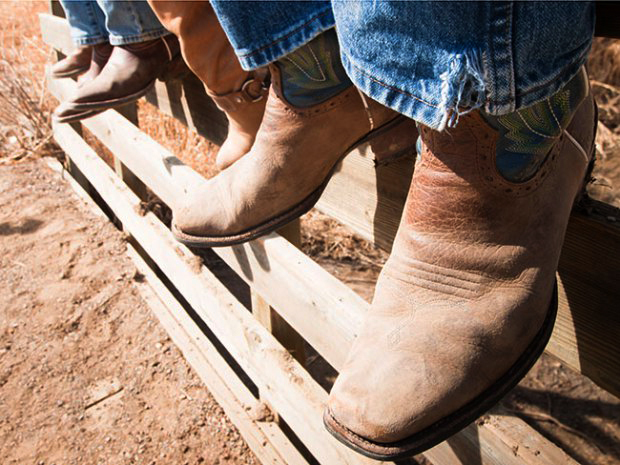 Keep in mind that cowboy boots are not the most comfortable to walk in, because they were designed for riding. However, they do have an important place in fashion, with different types of cowboy boots having come over the years. Various adjustments have also been made to them to make them more comfortable for walking. Work boot: As with work wear, the work boot has a solid place in men’s fashion. They are not only warm and comfortable for the winter months, but also strong and sturdy enough to survive any kind of rough job. Work boots are usually made of thick cowhide, and are steel-toed. Timberlands and Red Wings are examples of the work boot. Harness boot: Also called riding boots, these are made for any kind of riding – from horseback to motorcycle. They are also made with the toughest leather available. As already mentioned, all boots and shoes have machine-made and handmade versions. Handmade boots are far superior in quality and craftsmanship. Let’s find out how. Handmade boots are just like tailored clothing. They fit you better and also last longer. Besides, handmade boots are made just for you and with lower taxes they are much more affordable. They are unique and will not fit anyone else. Mass produced shoes or boots may be made of quality materials but they are definitely not unique. Let’s talk about some main differences between machine made and handmade boots. Materials: Mass produced boots use machines for all the important parts of the manufacturing process. Even though machines help in producing uniformity, they are not designed to handle pure leather. The leather used for machine-made shoes or boots are highly processed synthetic leather that are not as durable as conventional leather and do not age as well either. They tend to crack very easily and creams and polishes are usually ineffective to prolong their life. Soles: Almost all machine made leather boots come with rubber soles which is something the Romans and Greeks would have fought for! Although this may seem convenient because we walk mainly on concrete surfaces, but for the utmost comfort and longevity the soles of leather shoes or boots should also be made of leather. This is something you only get in handmade leather boots. Hand lasts: Leather shoes or boots are made around a wooden or plastic form that gives them shape. In handmade boots, this shape is produced by stretching the leather by hand after soaking it in water for an hour or so. After this the boots are left to dry for at least three days so that they don’t lose their form. In a factory setting, this process is rushed, leading to uneven shape and form. Quality control: It goes without saying that the quality control for handmade both are much superior to that of mass-produced machine made shoes or boots. When each pair of boots is made by hand, special attention is paid to every single product to make sure that all of them adhere to the highest standards. In mass-produced shoes, no one pays such attention to quality or details. The result is that even after paying a handsome price for a pair of branded leather boots, you don’t get the durability or the longevity you had hoped for. Customization: The biggest advantage of handmade boots is the ability to customize each and every aspect of the shoe. From what kind of leather you want to the color of the show to personalization details, every pair of boot becomes something to treasure. That is never ever available in an off-the-shelf boot. 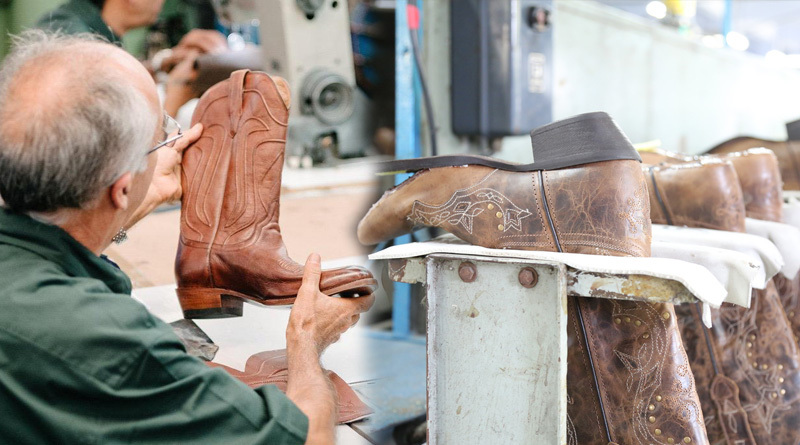 The process of making handmade boots is more rigorous and time-consuming than making shoes on a machine. Regardless of the kind of boots you buy, when they are handmade they all take a minimum of five to six weeks to be made before they can be delivered. When each boot is made by hand down to the very last detail, they become pieces of art and bespoke style. Even wondered what the handmade boot making process is like? Here is a step-by-step breakdown of the whole process. Measurement: The very first step is taking the measurements of the boot to be made. Customers are sent a form to fill in for customization details, and these need to be as accurate as possible. This will ensure that the shoe has the right fit and is comfortable to wear. From the color to the type of leather, the customer can choose everything. Design: Guided by the customization details sent by the customer, a model is created using a measurement tape and a pencil on a cardboard. Selecting leather: In a handmade boot, choosing the leather is half the job. Depending upon the type of boot, the leather will be selected by thoroughly checking the hide for imperfections before cutting begins. Unlike machine-made boots, the cutting is done by hand in handmade boots, using the cardboard model. Customization details: In a handmade boot, you are able to add accessories or get your name embroidered on the leather. This is done after the leather is cut to shape. Sewing: After cutting the design and putting in the personalization, the sewing begins, where the cut pieces of leather are sewn to give the boot its shape and form. Assembly: Putting on the underside and sole to the boot is the most significant part of the process. Even the latest machine cannot be better than a master craftsman here. By sewing on a durable sole made of quality leather, the lifespan of the boot is prolonged. Quality control: Each handmade boot is specifically checked to make sure they are exactly like what the customer had asked for. Once the quality check is done, the boots are packed and ready to be shipped to the customer. Although handmade boots take a lot of time and effort, they are worth it, because they are unique. No two pairs of handmade boots are alike, so that makes you a proud owner of a handmade boot. While off-the-shelf boots are good for the purpose they are made for, if you can, try to invest in at least one pair of handmade boot. You won’t regret it.